Ulstein Group is planning to take its revolutionary X-Bow design beyond the offshore sector. "The principle features of the Ulstein X-Bow are as relevant for a number of merchant vessel applications as they have proven to be for offshore applications," says managing director in Ulstein Design Rolf Inge Roth. Heading the development of new concepts utilizing the X-Bow for merchant applications is Cem Aktüre, technical manager of Ulstein Es-Cad. The design and engineering company Ulstein Es-Cad was founded in 2006 to increase the engineering capacity of the Ulstein Group. 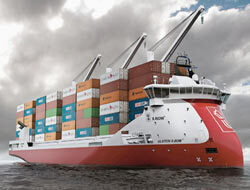 Ulstein Es-Cad and Ulstein Design have already developed a concept containership design utilizing the X-Bow. Ulstein Es-Cad is located in Istanbul , Turkey, and has 14 employees. The original company, ES-CAD, was founded 5 years ago, and the general manager, Engin Sezen, and technical manager, Cem Aktüre, are partners in the new Ulstein company. "The features of Ulstein X-Bow directly translate to enhanced profitability by increasing the earnings potential and reducing the operating costs of vessels, while also offering environmental advantages," says Aktüre. Small and medium sized vessels engaged in regional trades are particularly well set set to capitalize on the benefits offered by the X-Bow and Ulstein is currently evaluating its use on container feeder vessels, ro-ro vessels and certain general cargo vessels.